[Corvallis Gazette-Times, March 21, 2013] — The Corvallis Planning Commission unanimously passed Oregon State University’s proposal for a new residence hall Thursday night. The vote came at the end of a three-hour meeting that included some contentious testimony from residents concerned about parking and traffic. OSU hopes to build a residence hall that would house up to 300 students on what is now a parking lot whose boundaries are Southwest Adams Avenue, Southwest Washington Avenue, Southwest 13th Street and Southwest 14th Street. The proposal required city approval because it represented an adjustment to OSU’s master plan. The commission also passed a recommendation on a Land Development Code text amendment that must accompany the master plan adjustment. [KLCC, March 18, 2013] — Oregon State University plans to build a new residence hall on what’s now a parking lot. The $30 million building would provide housing for 300 students. Oregon State is looking at a long term need for more on-campus housing. It’s recently adopted a policy requiring traditional first year students– aged 18 and 19– to live on campus, with some exceptions. Tom Scheuermann is Director of University Housing and Dining Services. He says enrollment is increasing. This fall, University Housing & Dining Services brings you the chance to win plasma TV for your room and to be featured in photos for upcoming UHDS publications. 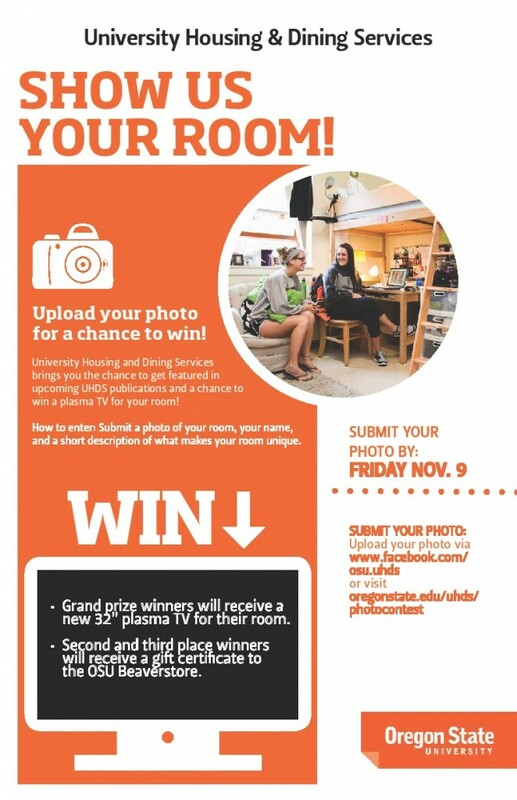 How to enter: Submit a photo of your room, your name, and short description of what makes your room unique via oregonstate.edu/uhds/photocontest. Photo submissions will also be added to Facebook album on the UHDS Facebook page. Prizes: Grand prize winners will receive a new 32” plasma television sponsored by the Residence Hall Association. Second and third place winners will receive a gift certificate to the OSU Beaver Store. Top six finalists agree to have their rooms featured in photo shoots for UHDS. Rules: Each room is limited to one photo; photos submitted must be your own room; photos may include you or your roommates in them; photos that show anything that breaks UHDS rules will automatically be disqualified. All contest entries are due by FRIDAY, NOV. 9. [Corvallis Gazette-Times, March 7, 2012] — Oregon State University will receive funds to build the Student Experience Center and a residence hall, after all. Lawmakers passed a set of bills at the end of the Legislature’s short interim session, which adjourned Monday night. They approved millions of dollars in IX-F bonds for the new student center, a remodel of the Memorial Union’s east wing and a 270-bed residence hall. Student fees will pay back the $47.2 million student center and $9.18 million renovation. Room and board fees will cover the $29 million residence hall. Lawmakers put the projects on hold after the end of the last legislative session in June over concerns about the state’s ability to carry additional debt. OSU President Ed Ray, students and Oregon University System officials testified on behalf of the projects in front of the Legislature’s Joint Ways and Means Committee in November. Another OSU construction project — a classroom building — was also put on hold at the end of the last session, but the university plans to pitch the project during next year’s legislative session. The news of the projects’ approval was great news for the university, especially for student groups involved in the student center project. “They saw the need early on and worked to make this project come to life,” said Tiffany Perkins, an OSU senior who co-chaired the student committee that helped the project pass an initial student vote. Students voted in May 2010 to pay $48 a term beginning last fall to pay off the bond. With funding secured, students will be charged the fee beginning spring term, and construction will begin January 2013, said Michael Henthorne, the director of the MU. The new building will replace Snell Hall, built in 1959 as housing to accommodate the enrollment booms of the post-World War II and Korean War era. It now houses various student organizations and offices but it has numerous major structural deficits. See the original article by Gazette-Times reporter Gail Cole. [Daily Barometer, Feb. 23, 2012] — RecycleMania is now on its fifth week. Many events are already over, and were successful. Some are happening right now, including the Res Hall Competition. And more are still to come. Besides the overall competition, the Beavers are leading the Civil War thus far. The results up to this point are Oregon State University at 8.5 pounds per person and University of Oregon at 5.9 pounds. Currently McNary Hall is ahead with 2.6 pounds per capita of recycling. Each hall has an “Eco Warrior,” who is that hall’s contact for the challenge. Sackett Hall’s Eco Warrior is holding a competition for who can make the best sculpture out of recycling. Read the full article by Gwen Shaw. [Campus Living, Nov. 4, 2011] — It’s that Time of Year: RA Search! Fall is not even over yet, but you may already be thinking about your plans for next year. Does being a Resident Assistant (RA) fit into your plans? Applications are available starting Monday, Nov. 28 and close at 11:59 p.m. on Monday, Jan. 16. More information and the application can be found by visiting www.oregonstate.edu/uhds/whyira.